MANILA, Philippines - Robert Bolick disrupted CJ Perez’ MVP party as the Red Lions devoured the Pirates, 94-87, to seal NCAA Finals Game 1 on Friday, November 11, 2017 at the Smart Araneta Coliseum. The last time that Lyceum Pirates and San Beda Red Lions faced each other, 40 minutes of game time wasn’t enough and they needed 10 more minutes to settle the score. After 2 overtimes, the Pirates swept the elimination rounds and claimed the automatic finals berth. Today, the 18-0 record of Lyceum was reset as they stand toe-to-toe against the fierce Red Lions for the Championship. The Pirates placed themselves in the attack mode as early as the game clock ticked. Led by shooting guard Jeff Santos, Lyceum got ahead of San Beda by 5. The combo of Robert Bolick and Davon Potts however, provided a decent run for the Lions to close the margin. At the 2:50 mark of the first, newly crowned MVP CJ Perez drove hard to the basket but landed awkwardly on the floor and seemed to twist his ankle. Coach Topex Robinson immediately called the timeout to attend to the ailing MVP. But Perez slowly stood up and shook his foot. San Beda Center Donald Tanqoua flexed his muscled hard to initiate his team’s 8-2 run and snatched the lead from Lyceum as the 1st quarter ended. 22-21 in favor of the Mendiola-based squad. CJ Perez started the second on the bench but Lyceum still managed to regain the lead as Team Captain Jesper Ayaay and the Marcelino Twins took charge offensively. Ran Tongco however, countered and signaled the seesaw battle. Midway of the 2nd period, the Pirates widened their lead to a double-digit for the first time. But AC Soberano was too prompt to react and slashed the margin back to a single-digit. Lyceum wrapped-up the first half with a 5-point, 50-45 advantage with CJ Perez leading his team with 10 points. Turnovers were the key difference in the game. San Beda inadvertently committed 15 turnovers against Lyceum’s only 6. The Pirates capitalized on the Lions’ errors and converted them to 20 points. As the Pirates started the second half, the Marcelino twins charged and led the onslaught and posted a dozen point lead with barely 2 minutes gone by. San Beda made another scoring blitz and closed in with Lyceum. All of a sudden, the Pirates were forcing their shots and started to miss and transferred the momentum to their opponents. The Red Lions turned the tides, 61-60 with 3 more minutes left in the 3rd quarter. Lyceum barely caught up as both teams ended the penultimate quarter in a tie and the first deadlock of the game, 64-all. Jayvee Mocon unfolded the 4th quarter with a sure ball trey followed by Robert Bolick’s drive for an instant 5-point lead. The game got more interesting as CJ Perez unleashed 8 quick points for another deadlock, 72-all. Jayvee Mocon and Robert Bolick protected their lead as the 2-minute warning was announced. San Beda Red Lions possessed a 5-point lead under a minute remaining in the game clock. Robert Bolick dropped a dagger 2-pointer as the Red Lions secured a 7-point advantage with 30 more ticks left. Lyceum didn’t want to go down without a gallant fight and still managed to score 5 quick point in less than 10 seconds. San Beda however, was up by 2 shots with exactly 20 seconds remaining in the ballgame. 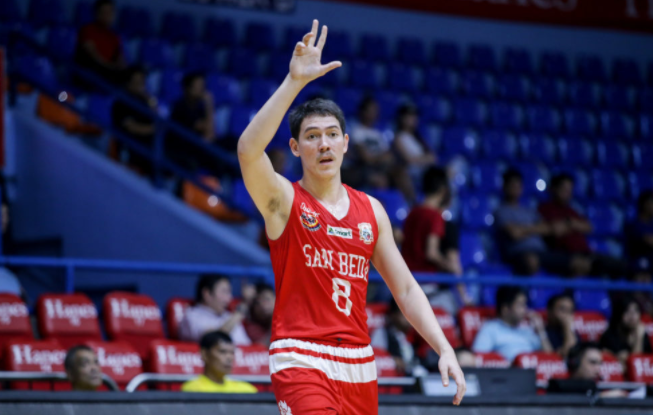 “King Lion” Robert Bolick split his charities to add a point to the Red Lions lead while Davon Potts completed his foul shots to seal the game number 1, 94-87. Bolick came alive in the 4th quarter and finished the game with 24 points to win the Best Player of the game. The Pirates will be marching onto Game number 2 with their back against the wall while defending champions Red Lions will try to finish the series off on November 16 at the Smart Araneta Coliseum.